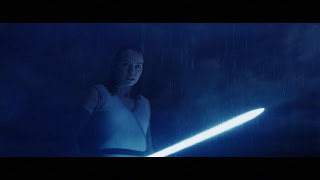 When The Force Awakens ended with a silent Luke Skywalker (Mark Hamill) being offered his old Lightsaber by Rey (Daisy Ridley) many theories were thrown about as to what would happen next. With the release of The Last Jedi we finally find out what Luke has been doing and it ended up being a movie with some divisive reactions but one I love and appreciate for what it tried to achieve. The movie has some issues, but the Blu-ray release is an amazing treat filled with excellent special features and a phenomenal transfer. 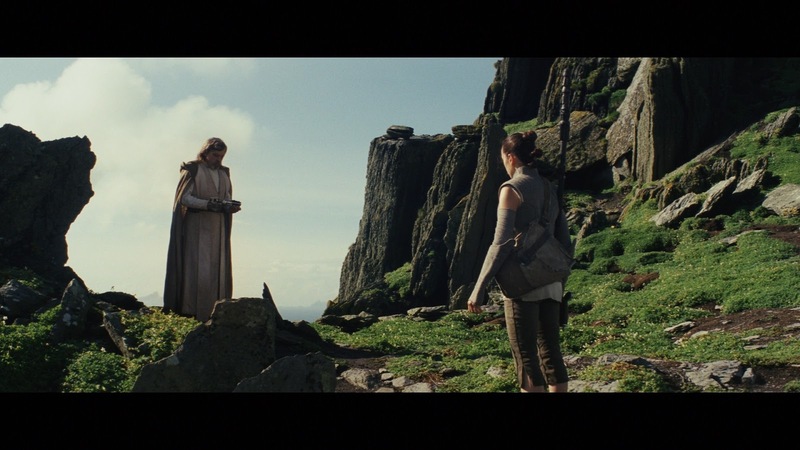 The Last Jedi follows immediately after the events of The Force Awakens with the resistance on the run and Rey attempting to bring Luke back to help against the First order. The problem is Luke does not want to go back and his reasoning and actions are a big source of the backlash against the film. I personally loved the movie and have some strong feelings on why Luke is acting the way he does but it is not perfect. Luke has always been conflicted about his role as a Jedi, he self proclaimed himself a master but struggled to contain his emotions and feelings. He almost succumbed to his inclination to end Ben Solo (Adam Driver) before he turned completely. When Kylo Ren was born from the ashes of Ben Solo Luke saw he failed the order and could not accept that failure as a lesson to be used for a new path. Yoda says this himself that failure is the greatest lesson and one that would have taught Luke that his path did not have to be Jedi or Sith but something new. Rey is that something new, I would not call her the last Jedi - I would say she is a Force user who has morals, purpose and wants to do good. Luke was right it is time for the Jedi to end and Rey will be that dawn of a new type of force user to battle the evil of the galaxy. 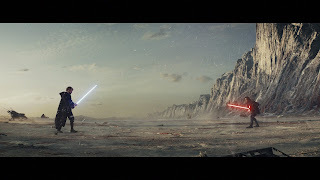 Luke should have accepted his failure and in the end he did, by confronting Kylo and letting him know that he accepts what happened he could finally let go. He had held off the Force for so long once he used it in such a powerful fashion his body succumbed and he joined the force in spirit as Ben Kenobi did in the New Hope. 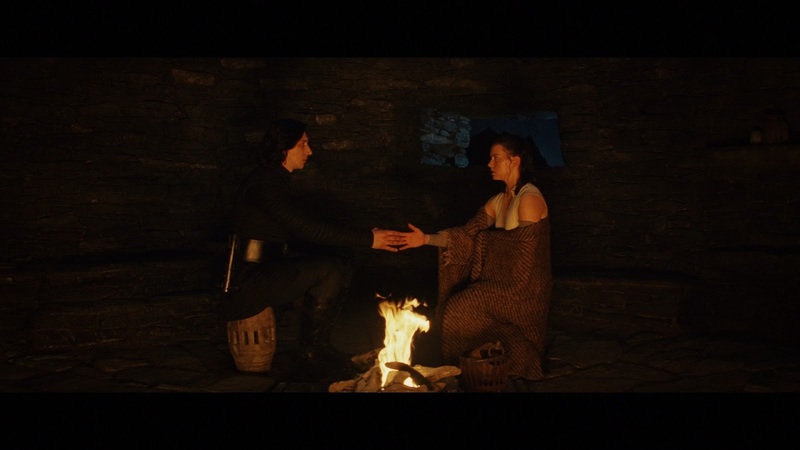 The further evolution of Kylo Ren is also threaded in their story quite well with Rey and Kylo developing an unexpected bond that I found worked quite well. Kylo is still very much an angry and incredibly strong man child, but we see him in a new light with the depth of his relationship with Snoke and Luke defined far more clearly in this installment. His dynamic relationship between Luke (hate and envy) and Rey (kinship and perhaps love) is very interesting to watch unfold. 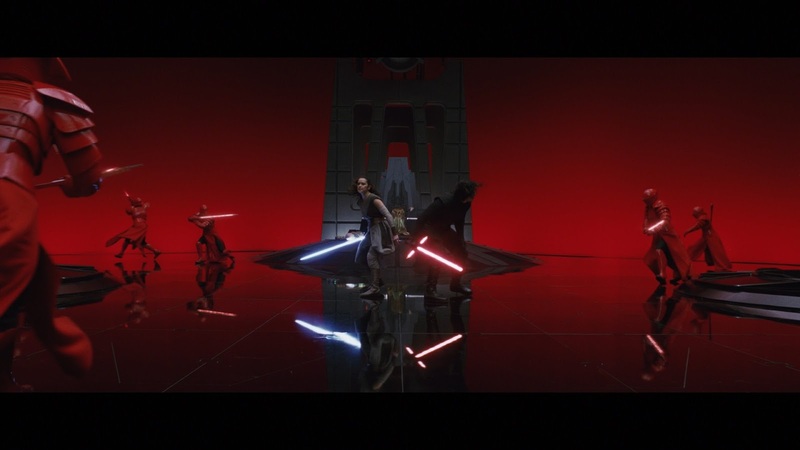 Luke, Kylo and Rey are the most pivotal part of The Last Jedi but a great deal of other events happened as well while the resistance ran from the New Order. Much of it was great stuff, Leia (Carrie Fisher) was able to show how much of a leader and inspiration she became. 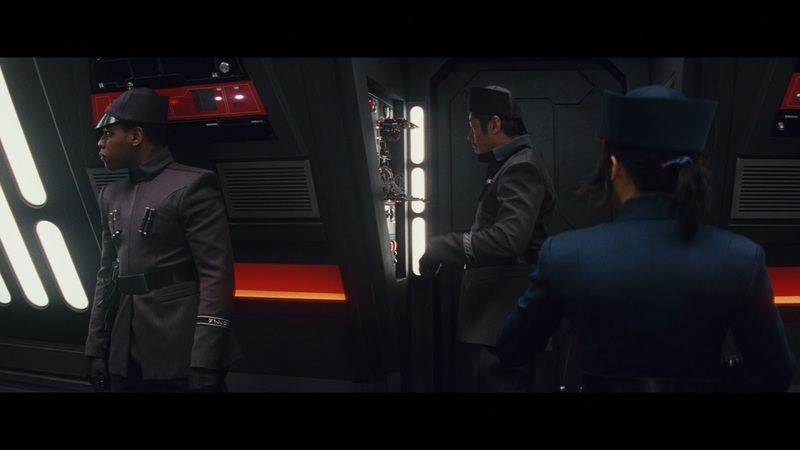 Poe (Oscar Issac) learned that simply blowing things up does not make you a great leader. Finn (John Boyega) and newcomer Rose (Kelly Marie Tran) try - and essentially fail to stop the New Order from tracking the fleet. Not all is perfect though, in particular I found the entire Canto Bight sequence to be excessively long and boring. The walk through the casino, escape sequence and chase all dragged the movie down and deflated the momentum. 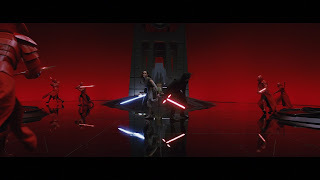 While watching at home for this review (my 4th viewing) I actually fast forwarded much of Canto Bight (my kids suggested it as well) just to keep the pace consistent. I did really enjoy the character of DJ (Benicio Del Toro) and liked that he broke the Han Solo model by not redeeming himself in the end. Some characters also get treated oddly. Chewbacca, R2D2 and C3P0 are underused as a whole and Vice Admiral Holdo (Laura Dern) is written poorly. 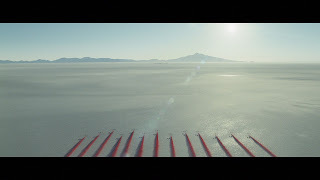 The character itself is interesting but plot points seemingly have her acting in ways a true leader would not have and unfortunately made the character less than it could have been. Aside from those quibbles much of the goings on are very interesting and represented extremely well in the film. I truly enjoyed most of the characters and actually smiled whenever Rose was on screen. The movie itself as a whole is intensely satisfying and goes places we did not expect Star Wars to go and I for one greatly appreciated that. My sons and I ran a poll of best Star Wars films overall (including Prequels and Rogue One) and we all had The Last Jedi as first or second on the list. For me it is not quite as great as The Empire Strikes Back but comes close which is high praise as far as I am concerned. Disney continues to impress with it's Blu-ray transfers, The Last Jedi is reference quality and is striking to behold in 1080p resolution. There is a consistent light film grain to the image that is very pleasing at adds texture to the experience. Black levels are deep and inky, colors pop from the screen and details are ever present. The shine of C3P0's golden body, individual hairs on Chewbacca, Lukes lined face and Kylo's scar all are present in striking detail. Being able to get up close and personal on a home release of such quality allowed me to really appreciate the detail of the tech and character designs. The antiseptic cleanliness of the First Order ships to the dirty tun down rebel bases all came across with fresh details and clarity. 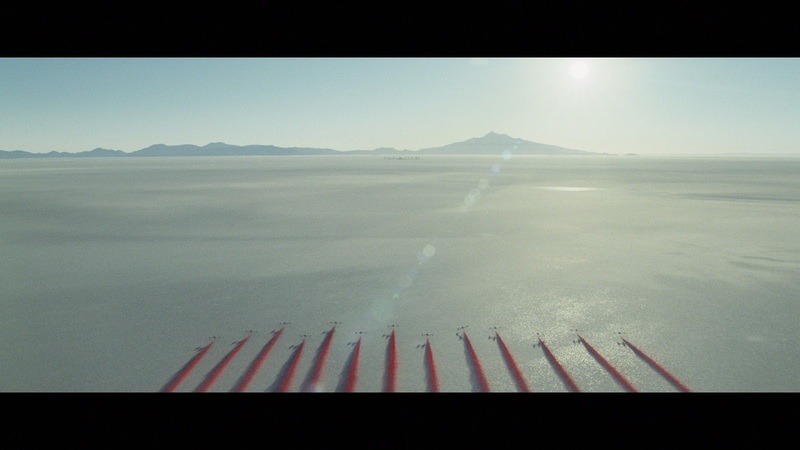 A truly striking visual experience and a treat to watch. While the Blu-ray release of The Last Jedi does not feature the Dolby Atmos soundtrack found on the premium UHD release it does have an incredibly well done DTS-HD Master Audio 7.1 lossless presentation. The Audio is set on the low side of the configuration meaning you may have to tweak your volume a little higher than normal, but once you do it is stellar. Dialogue is clear and persistent, with all angles of conversation coming across in realistic and consistent ways. Surround channels are used exceptionally well with ambient noises, crowd movement and louder actions portrayed in excellent ways. Ships and blasts zing all around especially in crowded battle or space scenes. Bass is used very well with deep thrums and vibrations felt when appropriate and not overused. The audio is as important in this movie as the visuals and Disney nailed it with this soundtrack. It is rare that I enjoy the extra features on a Blu-ray release as much as I did these. The last time I enjoyed them this much was on the Lord of The Rings trilogy extended editions. It is also rare that so much quality extras exist on a first run release of a Blu-ray. Two features stand out as truly exceptional. The Balance of the Force and the full length documentary The Director and the Jedi add so much to the experience of the movie and are a joy to watch. 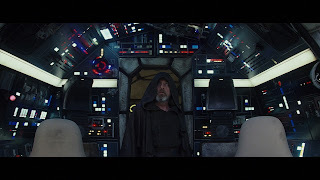 In the Balance of the Force the director sheds light on the Jedi path and Luke's role which adds amazing depth to the scenario. The documentary shows an essentially raw look at the epic undertaking that was The Last Jedi. It is not a glossy marketing doc, but instead shows some of the wrinkles and scars behind the shooting. Mark Hamill's disagreement with Luke's representation, budget concerns and the passing of Carrie Fisher are all discussed and shown with frank detail. 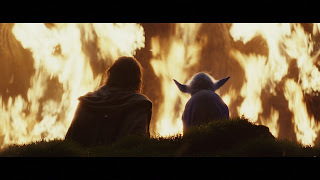 There are also many heartwarming moments, in particular the care and love Rian Johnson has for the material and franchise at large. A must watch for any Star Wars fan. The rest of the features are all very good as well, many of the deleted scenes are well worth being re-added to the film, the sequence of Andy Serkis acting as Snoke gave me chills and the scene breakdowns were very interesting. The audio commentary is very interesting as well with numerous interesting insights into the filming, writing and creative process Rian Johnson went through. Balance of the Force - Explore the mythology of the Force and why Rian Johnson chose to interpret its role in such a unique way. The Last Jedi has a few controversial moments, but overall is a fascinating progression of the Skywalker saga. Old heroes continue to fall and new heroes step into the forefront in very interesting ways. The dynamics between the characters and the universe are fresh, dynamic and promise a bold approach as the trilogy continues with J.J. Abrams back for the next installment. A terrific audio and video transfer plus truly must watch extra features make this one of the better Blu-ray releases in recent years. It certainly stands out as the best overall Star Wars release I have experienced from a sheer quality and content perspective. This is a must have for any fan of the Star Wars universe and cinephiles in general due to the deep look at the process in the extra features.